This two-part series features some of the earliest Canadian Pacific Railway (CPR) hotels in British Columbia. Many of these hotels have since closed down but formed an important part of early Canadian railway history. In previous blog posts, we profiled the two largest surviving CPR hotels in B.C. : Hotel Vancouver and the Empress Hotel. 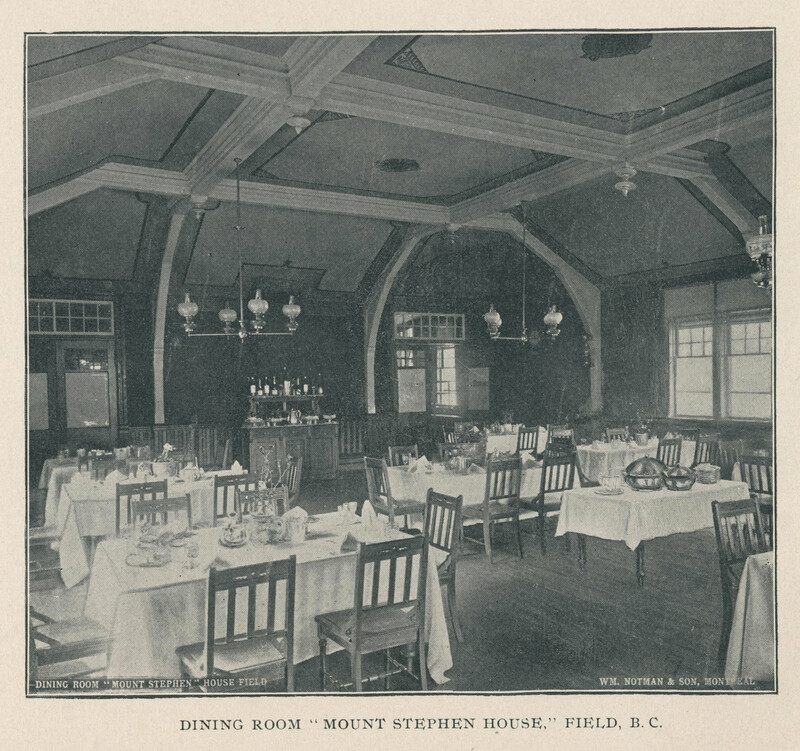 Mount Stephen House, Glacier House, and Fraser Canyon were the first three hotels developed by Canadian Pacific Railways in BC. Because it was difficult to bring dining cars through mountainous areas, the hotels were initially intended as “dining stations”. These three “chalet” style hotels were designed by the architect Thomas Sorby and had very similar designs, each with six or seven bedrooms. The Mount Stephen house, a pretty chalet-like hotel, is situated fifty miles west of Banff, in Kicking Horse Canon, at the base of Mount Stephen — the chief peak of the Rockies in this latitude, whose stupendous mass is lifted abruptly 8,000 feet above. This is a favorite stopping-place for tourists and mountain climbers, and there is good fly fishing for trout in a pretty lake nearby, and “big horns” and mountain goats are found in the vicinity…This is a favorite region for artists, the lights and shadows on the near and distant mountains giving especially interesting subjects for the brush. – The Canadian Pacific : the new highway to the east across the mountains, prairies & rivers of Canada, 1888, p. 51. 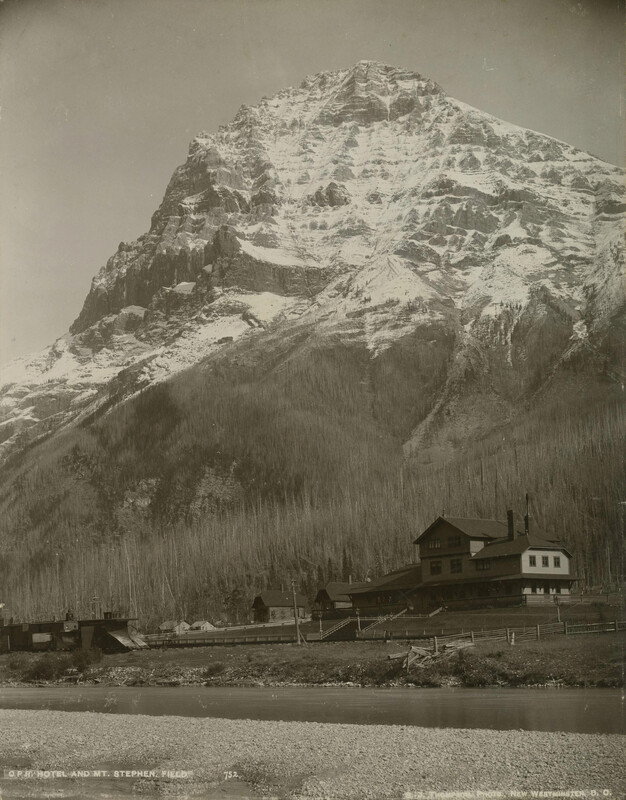 The nearby Mount Stephen was named after George Stephen, the Canadian Pacific Railway’s first president. 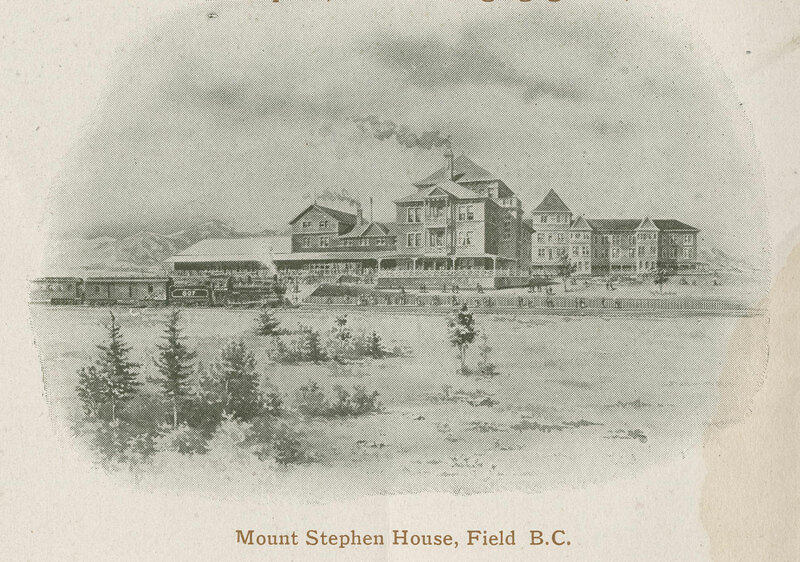 “Mount Stephen” house field, [between 1880 and 1891? ], from photograph album. C.P.R. Hotel and Mt. Stephen, Field, [between 1886 and 1906], from photograph album. Banff and the lakes in the clouds reached by the Canadian Pacific Railway, [1886? ], p. 20. Yoho Valley in the Canadian Rockies and the glaciers of the Selkirks, 1903, p. 4. The increasing popularity of Field, as its attractions have become better known, necessitated greater accommodation than the old Mt. Stephen House afforded. The result has been the erection of a new chalet hotel of the same name with much greater accommodation, suites of rooms with private baths, billiard room and the same admirable service which is characteristic of the Canadian Pacific Mountain hotels. It has a livery in connection where carriages, pack and saddle horses can be secured at moderate rates, and outfits of cooks and porters are also available. There is also a dark room at the disposal of guests for development of photographs. The rates range from $3.00 to $5.50 per day, with special arrangements for those making prolonged visits. 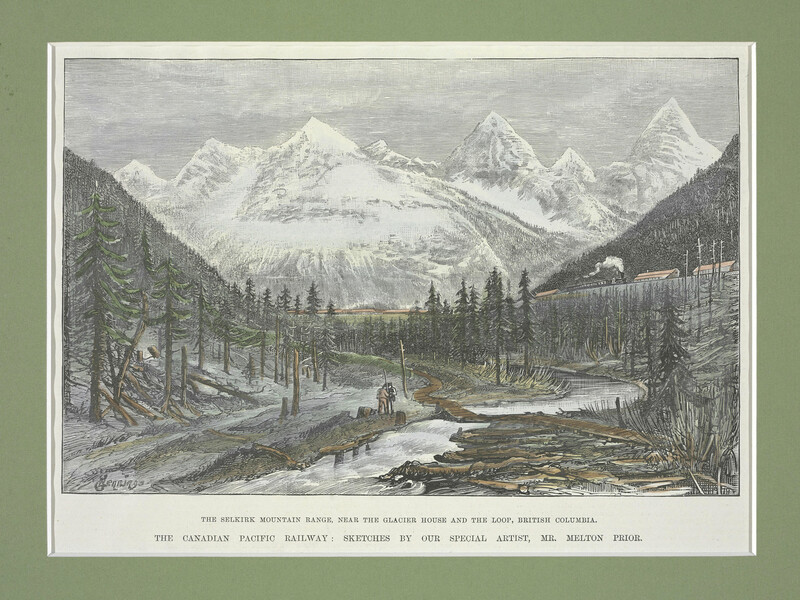 – Yoho Valley in the Canadian Rockies and the glaciers of the Selkirk, 1903, p. 4. The hotel closed in 1918 and was converted into a YMCA, which was demolished in 1963. 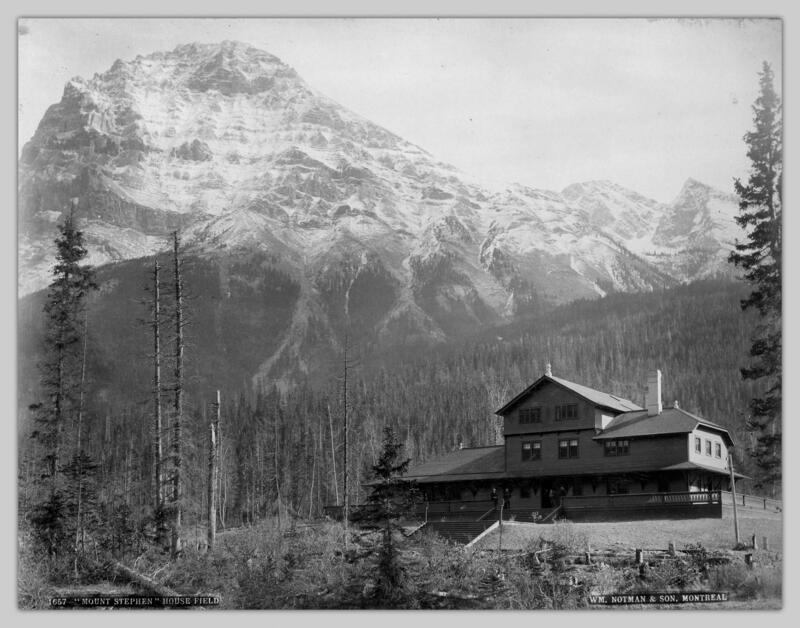 Glacier House opened in summer 1887 in Glacier National Park. Pamphlets in the Chung Collection list the hotel as open seasonally, during the summer months. 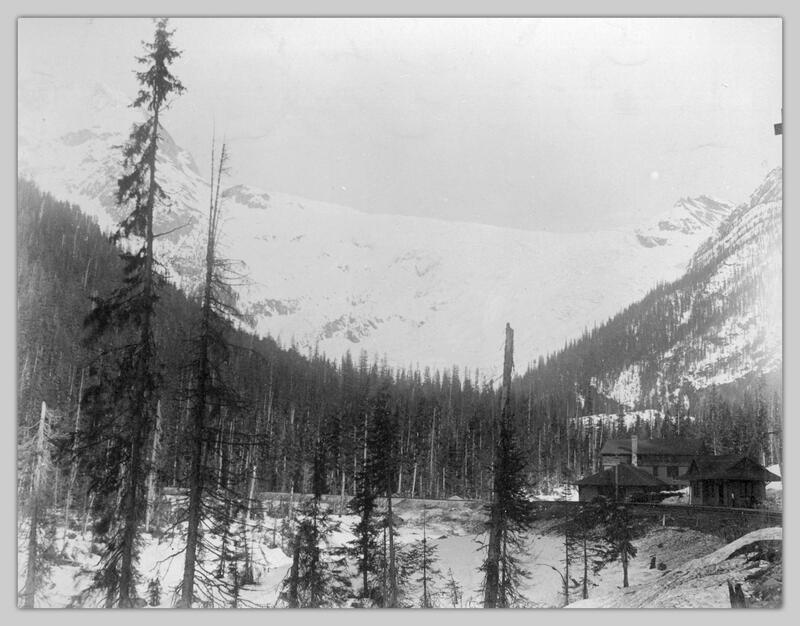 Glacier House among the Selkirks, [between 1890 and 1899?]. Canadian Pacific Railway bulletin, 1919, p. 6. Prior, Melton. The Selkirk Mountain Range, near the Glacier House and the Loop, British Columbia, 1888. Banff in the Canadian Rockies and the glaciers of the Selkirks, 1890, p. 4. 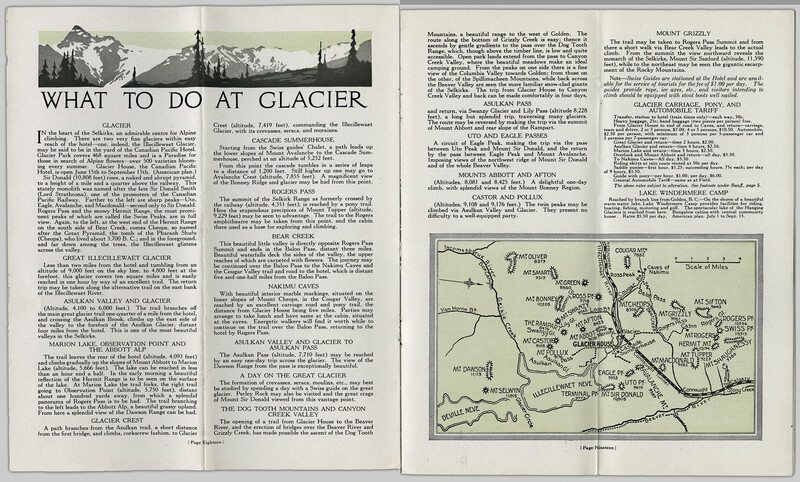 Resorts in the Canadian Pacific Rockies, 1922, p. 19-20. 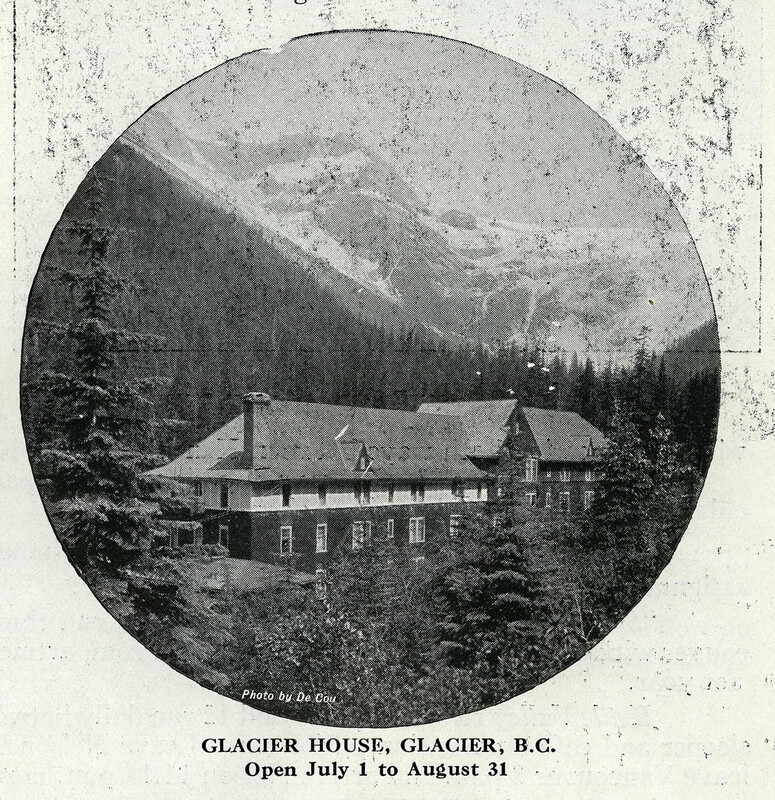 Due to its popularity, Glacier House had to be expanded twice—in 1892 and 1904—to accommodate demand. However, before they could expand the hotel, overflow guests slept in a sleeper car parked outside! After rail service to the hotel was terminated in 1917, Glacier House closed in 1926, and the building was demolished in 1929. The western-most of the first three CPR hotels in British Columbia, Fraser Canyon House, opened in summer 1887 in North Bend. 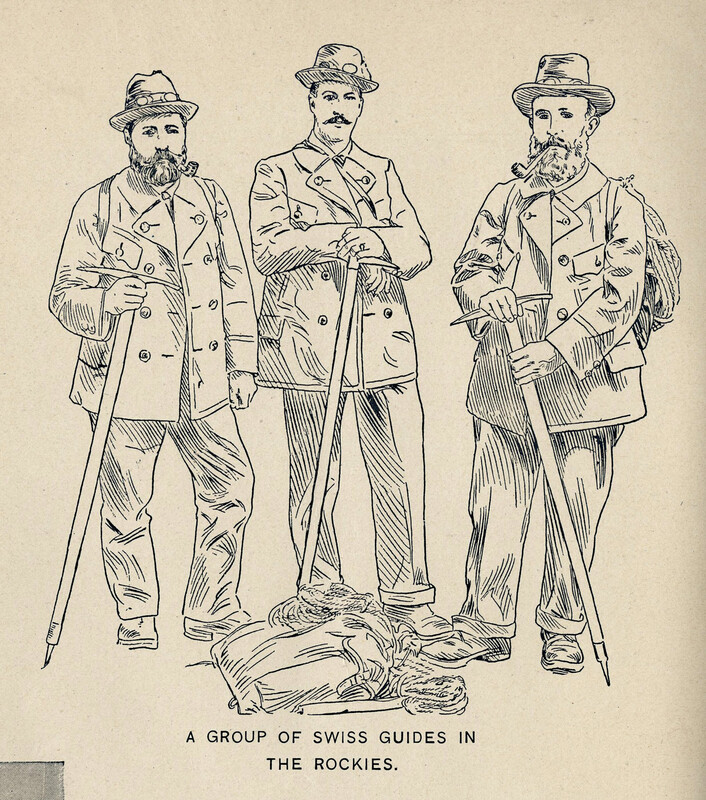 The challenge of the mountains, 1904, p. 82. 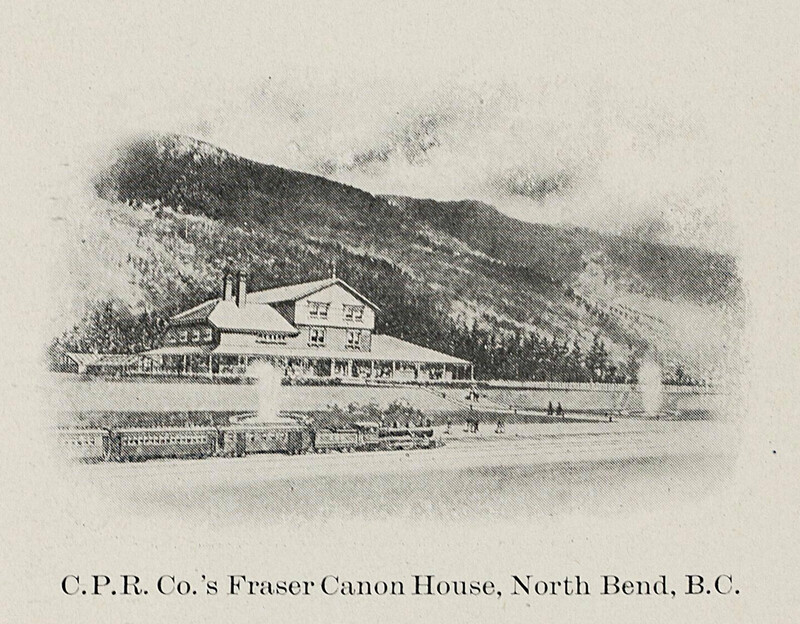 Note that in CPR pamphlets, the hotel’s name sometimes appeared as “Fraser Cañon House” or “Fraser Canon House”; it was later renamed the “North Bend Hotel”. When researching this blog post, we could find little information on what happened to the Fraser Canyon House, but according to Wikipedia, the original structure burned down in 1927. Brown, Ron. Train doesn’t stop here anymore: An illustrated history of railway stations in Canada. Toronto, CA: Dundurn, 2008. Denby, Elaine. Grand hotels: Reality & illusion: an architectural and social history. London: Reaktion Books, 1998. Hart, E. J. The Selling of Canada: The CPR and the Beginnings of Canadian Tourism. Banff: Altitude Publishing, 1983. McKee, William Carey and Georgeen Klassen. Trail of Iron: The CPR and the Birth of the West, 1880-1930. Vancouver: The Glenbow-Alberta Institution in association with Douglas & McIntyre, 1983. Canadian Pacific Railway. General Publicity Department. Canadian Pacific Facts and Figures. Montreal? : Canadian Pacific Foundation Library, 1937.